The Spitzer Space Telescope is trolling for huge, early galaxies in areas of the sky such as this COSMOS field, which is short for Cosmic Evolution Survey. 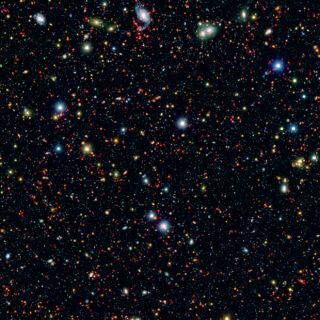 Astronomers using a NASA space telescope are in the midst of a survey designed to figure out how galaxies in the young universe grew so quickly. The first results from the project, which used the Spitzer Space Telescope, show hundreds of huge galaxies (100 times the mass of the Milky Way) that were around when the 13.8-billion-year-old universe was in its cosmic infancy. "If you think of our survey as fishing for galaxies in the cosmic sea, then we are finding many more big fish in deep waters than previously expected," lead author Charles Steinhardt, of NASA's Infrared Processing and Analysis Center (IPAC) at the California Institute of Technology in Pasadena, said in a statement. The project is dubbed SPLASH (short for Spitzer Large Area Survey with Hyper-Suprime-Cam). Researchers aim to use the telescope for 2,475 hours to look at two dark areas of the sky, far away from the Milky Way's field of stars. Scientists go fishing for galaxies in this funny graphic. The fields, which have been examined before, are called the Cosmic Evolution Survey (COSMOS) and Subaru/XMM-Newton deep field (SXDS). Each sky area is about the size of eight full moons. Spitzer's examination in infrared wavelengths will help astronomers see the masses of these galaxies. Star formation models now postulate that the earliest galaxies crashed into each other and as they came together, grew larger and encouraged starbirth. However, this process would not work fast enough (as far as astronomers understand) to create the huge galaxies Spitzer is seeing between 800 million and 1.6 billion years after the universe was formed. Perhaps the first galaxies came into existence than scientists thought. While many astronomers believe galaxies began growing about 500 million years after the Big Bang that formed the universe, the growth rate works if this process started at 400 million years. But there are other theories as well. "It's really hard to form something so massive so quickly," Josh Speagle, co-author of the study from Harvard University in Massachusetts, said in the same statement. "So it's entirely possible that these galaxies have been forming stars continuously since the moment they were born." Scientists will take a closer look at these galaxies using the Subaru telescope in Hawaii, which will do several years of observations to follow up on what Spitzer found. The large project is possible with Spitzer because it is past its prime mission; its coolant ran out in 2009, meaning some of its instruments don't work. The telescope, however, is still able to work in two infrared channels despite being warmer, and now looks at bigger areas of the sky for longer. A paper based on the new study recently appeared in Astrophysical Journal Letters.